According to the Order, in November 2015, an attorney for appellant Timothy Blixseth filed an entry of appearance in Mr. Blixseth’s appeal to the Tenth Circuit, which seeks to revive a racketeering suit against Cushman & Wakefield and Credit Suisse. By filing his notice of appearance, Mr. Blixseth’s counsel triggered his obligation to apply for admission to the Tenth Circuit bar under Rule 46.2(A) the Order says. On the day after Mr. Blixseth’s counsel filed his notice of appearance, the Tenth Circuit notified him or the requirement that he comply with Rule 46.2(a). Mr. Blixseth’s counsel was again notified of his obligation to apply for admission with the Tenth Circuit bar in later December. Since then, the Tenth Circuit stated they had “contacted [Mr. Blixseth’s counsel] via email and telephone numerous times, both to remind him of his obligation to apply for admission to this court’s bar, and provide him with the information and assistance necessary to do so.” However, for whatever reason, Mr. Blixseth’s counsel has continually failed to apply for admission to the Tenth Circuit bar. As a result, “he remains in violation of 10th Cir. R. 46.2(A) the court said. 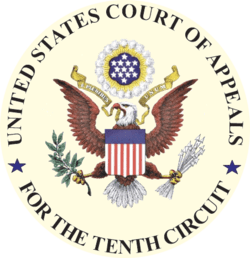 Previous Arbitration agreements cause Utah District Court to dismiss case and award attorney’s fees against plaintiff in C.R. England v. Swift Transportation Company, et al.